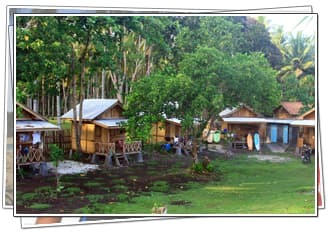 Paradise Surf Camp is located in the wave-rich Krui region of mainland Southern Sumatra. Sandwiched between some of the most consistent and varied coastline in Indonesia and located literally in front of an epic lefthander, Paradise offers private, budget bungalows to traveling surfers looking for a real Indo trip. Escape the crowds, the packed boats, and the aggression and spend some time in the Indonesia you've always dreamt of. Good waves, uncrowded lineups, and excellent freshly cooked local and western food all for less than $25USD per night. Also, make sure to check us out in the Garuda Orient Holidays Magazine! “Thanks Widya! I can't imagine a better Indo trip. Clean and tranquil accommodation on a beautiful coastline with perfect and uncrowded waves. Was really a dream trip, can't wait to get back! “ Yo Widya, thanks again for the hospitality, was a great way to escape Bali for a bit! My favorite part was the family dinners every night and the absolutely epic waves!